• DESCRIPTION: "Starting Over" - Enter the further adventures of Rich Rider, an ordinary college student who just wants to keep a steady job, hang out with his friends, and score the occasional date. There's just one problem: he's a hard luck super hero. Join Nova as he blasts into high-flying adventure and attempts to save the world--while he also tries to keep his life from falling apart! Issue #1 brings you up-to-date with the Human Rocket, fills you in on his origin, reveals his status with the New Warriors, introduces you to his new supporting cast, and sets the stage for the electrifying events to come! You want heroes? This issue guest-stars She-Hulk, Namorita and Speedball! Written by Erik Larsen. Art by Joe Bennett and Armando Durruthy. 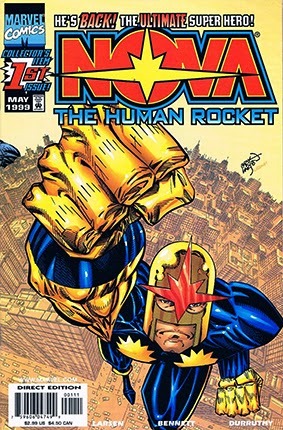 Wraparound cover by Erik Larsen.